Posted on March 15, 2013 by Elizabeth E.
I have blog followers (subscribers) on Google Reader, and I also use Google Reader. A LOT. So it was worth paying attention to the news when Google announced it was discontinuing Google Reader. While I’ve read multiple articles, I must admit my eyes glaze over when techie terms are mentioned. For those who aren’t affected by this announcement, it’s helpful to know that readers are a handy way to organize blogs into categories, allowing their Really Simple Syndication (RSS) feeds to be gathered up, allowing the reader to save posts, while also making them searchable from within the reader. So now it’s back to the hunt for easy-to-use products that will allow us to replace Google Reader. I did a search on RSS feeds for Macintosh and NewsBar (view, above) seems to be top-rated. I’ve been trying it out and I can customize colors, size of font, where I can put the floating feed (and I can make it disappear) among other things. I like that I can group my feeds as before, and that by clicking, it will show the post to the right with an option to open it in my browser. 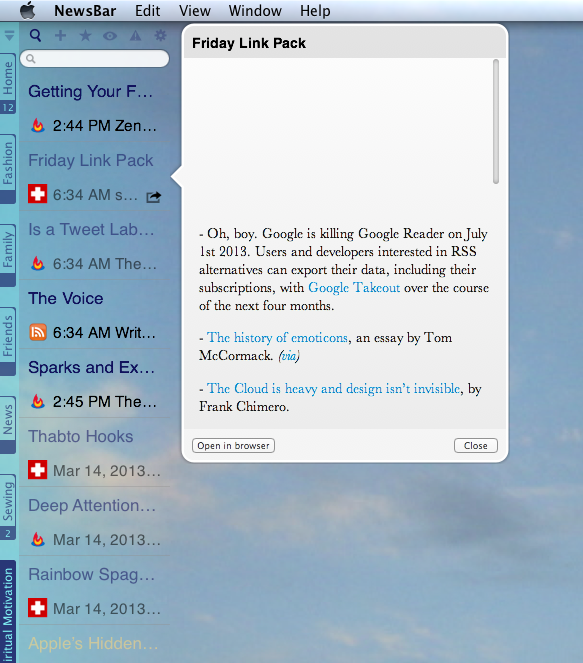 Once the RSS feeds have been uploaded, they are on their own and don’t refer back to Google’s reader. If NewsBar is open, and I’m reading a website I want to save, I merely click on the small “plus” sign and it will add it. In some cases (I’m still learning), I had to locate a site’s RSS feed icon (above), then copy and paste the feed address into NewsBar. I’ve added an RSS feed icon to my blog now, too. For the interim, we could start following lots of blogs, via their following service, then use filters in our emails to separate them off. This will work (I use it now for online quilt shops, family emails, and so forth), so if you want to follow me, you know how (fill in your email above; WordPress is a pretty good platform for this sort of thing). At any rate, we’ll back shortly, with a new post.